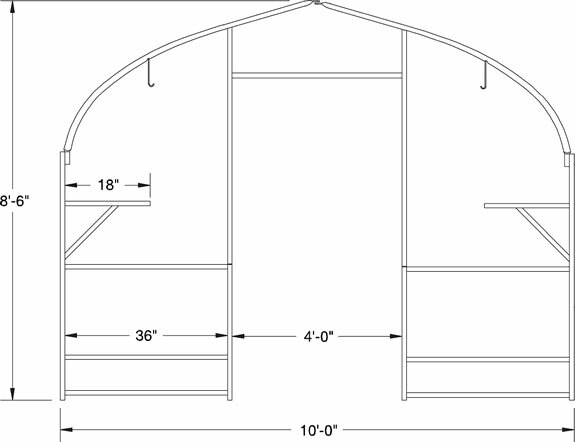 At 10' wide, the Bench-Mart Deluxe is a great seasonal greenhouse for smaller garden centers or where space is tight. Greenhouse assembles quickly with wing nuts while multilevel bench displays and hanging basket purlins display product at comfortable shopping levels. Bench tops, double swinging end door, slide-side ventiliation and poly covering are included. Standard metal benchtops shown to left. Roof & end wall poly film - Choice of white or clear poly with Wiggle Wire attachment system. Integrated side benching - Built-in side display brackets get you up and selling in no time. Just add plants! Double swinging end door - Wide swinging end doors allows your customers easy access. Optional additional end door provides flow through customer traffic.